Over the last year, I have been participating in a Student Leadership Programme. As a result of my engagement in the programme I was invited to speak at the Council of Deans of Health’s Annual Conference, held at the British Medical Association in London. The organisers from the Council of Deans invited me to speak on a panel alongside a fellow healthcare student on the programme and we would be contributing to discussions held by the Chief Allied Healthcare Officer for NHS England; Suzanne Rastrick, and Professor Alistair Fitt, Chair of the Office for Students strategic interventions in health education disciplines (SIHED). It’s the Council’s most high-profile event and so the invitation to speak was an immense honour. The subject of the panel focused on, ‘Supporting vulnerability in Allied Health professions workforce,’ and the council sent me an outline of key topics we should cover. I began drafting out my ideas and points for discussion, which was a challenge because the topic and the audience was at a level new to me; exploring policy and strategy within recruitment and retention which transcended across educational and governmental levels. I decided to present my ideas on a poster, and began creating a visual representation of the allied healthcare professions inspired by the AHPs into action policy. I then communicated with my student colleagues from my cohort and set up a small forum to generate some additional ideas. Once complete I subsequently arranged a conference call with Sarah Bradder – a student therapeutic radiographer from Sheffield Hallam University, who would be presenting with me and representing student AHPs. We discussed our initial ideas and agreed on our topics of presentation to ensure we complimented one another without duplication. Event Photos: On the panel, presenting my poster and answering questions from the floor. On Tuesday 22nd January 2019 I travelled to London where I attended the event. 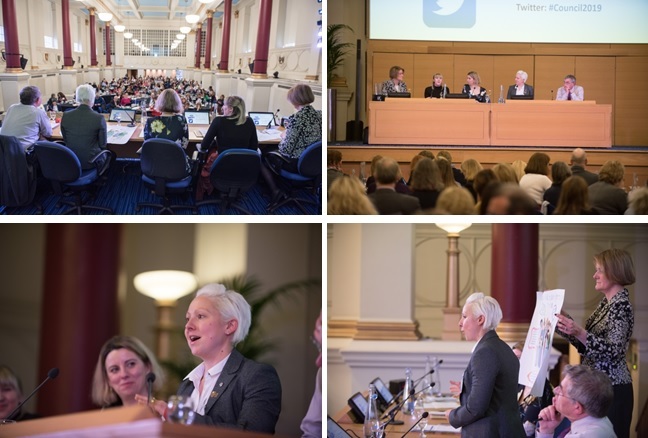 Over 100 delegates, University Deans and leaders in healthcare & academia were in attendance and presentations centred on the future of healthcare education and leadership. I sat on the ‘Supporting vulnerability in Allied Healthcare Professions Workforce,’ panel that afternoon and contributed to discussions on the future of Allied Healthcare Education, recruitment and retention. I never envisaged, when I embarked on a new career within healthcare, that I could be pursuing opportunities to get involved in discussions at this level, but thanks to the Council of Deans of Health I was honoured to be in attendance and share my thoughts and experiences as a Student Dietitian. Thanks to my collaboration with Sarah I felt well prepared and, although a little nervous, I felt an overwhelming sense of pride. I am passionate about promoting my future profession and the conference served as an empowering platform to do so. The experience of speaking on a panel was different to my experiences of preparing a presentation because here the audience was able to direct the discussion via questions on the mic and an online forum, which Dr Katerina Kolyva; our presenter on the panel would relay. This meant there was a lot more thinking on my feet, testing my ability to adapt and respond appropriately; a new experience, but no doubt invaluable in my professional and personal development as a future healthcare professional. At the close of the event was a networking drinks reception. It was here I met the Dean for my school at Leeds Beckett University and we were able to discuss potential future projects. What was so humbling was how delegates also seemed keen to speak with me. Feedback such as “you owned it,” and wanting to let me know how well they thought I had done was a real confidence boost. I exchanged details with a Dean from London South Bank University who has invited me to be a guest speaker at an upcoming professional development event and I also received a business card from a healthcare Dean at Manchester Metropolitan University, with potential to input on their new nutrition course. It was so great to hear from different people at the drinks reception about how they thought I did; a professor from Exeter University advised me to consider PhD, something I have recently considered as a long-term academic goal. The entire event has undoubtedly boosted my confidence and has potentially opened doors to new opportunities. I am eternally grateful for everyone at the Council of Deans of Health for the ever-growing opportunities.